The MICROBE-LIFT/TAC has powdered activated carbon which is well known for its abilities to clarify water by providing a point surface for bacteria to grow on. It then acts as a weighting agent to help these bacteria settle to the bottom, thus removing turbidity associated with dispersed bacteria. The carbon also acts as a detoxifier by adsorbing micro amounts of toxic materials; i.e. pesticides that can make their way into a pond. MICROBE-LIFT/TAC also has sodium bicarbonate-a buffer that can help stabilize the pH. 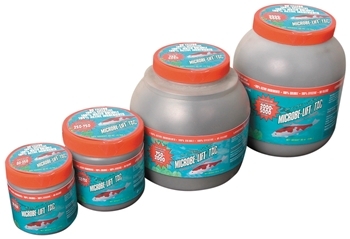 MICROBE-LIFT/TAC has sea salt that helps to induce a protective slime layer on fish.MICROBE-LIFT/TAC dry formulation has no odor.While MICROBE-LIFT/PL has become the #1 pond clarifier asked for by brand name, there have been, and will always be, people who prefer products in a dry powder form. Because there are opportunities to formulate certain dry components into a dry product that would not be practical to mix into a liquid, Ecological Laboratories has developed MICROBE-LIFT/TAC.